In order to successfully run this food blog, Kit and I review a lot of places thoroughly. This means that we order enough food for four or five people whenever we go out for tastings. Now, in order for us to not pack on the pounds, Kit and I have to be very disciplined when it comes to working out because if we don’t.. we’ll start resembling the food that we eat! One thing that we do together every year is to participate in runs together and we have a tradition after every race that we take part in – our run is always followed by a heavy protein breakfast to fill us up. We usually head to Coffee Bean & Bistro for our fill of coffee and protein however, this time around, we decided to stop by The Bravery since we were about 10 minutes away. During our recent bake sale, Kit had the pleasure of speaking with one of the owners of The Bravery and upon confirmation that they are Muslim-owned and use halal meats and ingredients, we decided to pay them a visit after we were done with a 5km run. I’ll admit that it took Kit and I a good few minutes to figure out how in the world to enter the cafe. I’m quite sure that people on the inside might have been sniggering at us, standing outside the cafe, trying to figure out how to enter it. Well.. here’s a quick tip – look for the gold door and push it open. That should do the trick. Unlike most cafes that we’ve visited, what I immediately noticed about this one was that it wasn’t too small or overly crowded with people. Most cafes try to pack in as many tables and chairs to serve as many patrons as they possibly can. However, The Bravery seemed to embrace space rather than constrain it. I was a little shocked by the gold horse in the middle of the room but my attention was soon drawn by the smell of coffee wafting through the air. We took our own sweet time to place our orders because, truth be told, this is the first cafe where Kit has more than one or two things that she could try! Their dishes are very ovo-lacto vegetarian friendly so she could enjoy more than just the usual cafe fare of pancakes or scrambled eggs. Between the two of us, we ordered a serving of Croustini ($7.50), Eggs on Toast with a side of avocado ($10.50), a Pancake Stack ($15) and a Smoked Salmon Sandwich ($14). We also ordered a lavender latte ($5.50) and a soy latte ($4.50 + $0.80 for the soy milk). 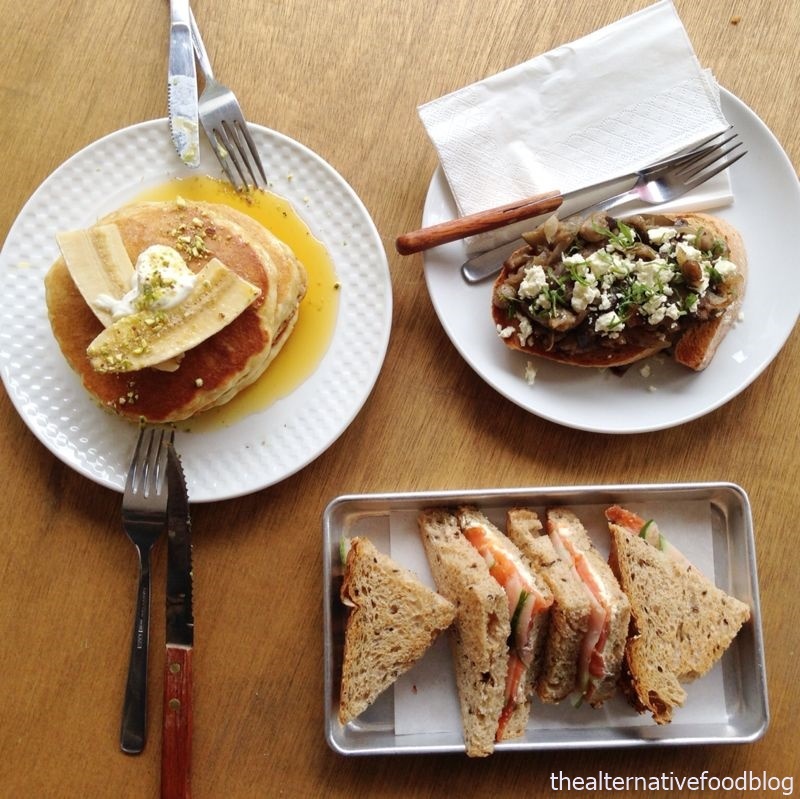 Since most of the items were ovo-lacto vegetarian friendly, we decided to share all of the dishes except for the Smoked Salmon Sandwich, which I happily devoured on my own. Kit and I chose to sit outdoors and enjoy the morning breeze while we enjoyed our Eggs on Toast. I chose to have poached eggs and requested an add-on of avocado on my plate. The prices for add-ons vary from $2.50 for avocado to $3.50 for turkey bacon. Prior to visiting them, my usual poached eggs fix came from Penny University. However, I think it now goes without saying that The Bravery holds the number one spot in my stomach for poached eggs. There is something so wonderful about the texture of their poached eggs – soft and cooked to perfection. It’s not overly rubbery as can happen when the eggs are overpoached and they were so thoughtful to season the poached egg with salt and pepper such that it doesn’t taste of vinegar as some poached eggs that I’ve tasted taste like. When I slowly broke my poached egg open, I was happy as punch to see runny yolk the colour of the golden sun. One of Kit’s pet peeves with poached eggs is the ‘raw’ taste that comes when your yolk hasn’t been cooked well, but none of that rawness was present with this dish. As an added bonus, the avocado was soft but not mushy and the extra bit of lemon that came with the dish tied the buttered toast, poached eggs and avocados together. We were singing our praises for this simple yet flavourful meal. It was definitely worth every dollar. 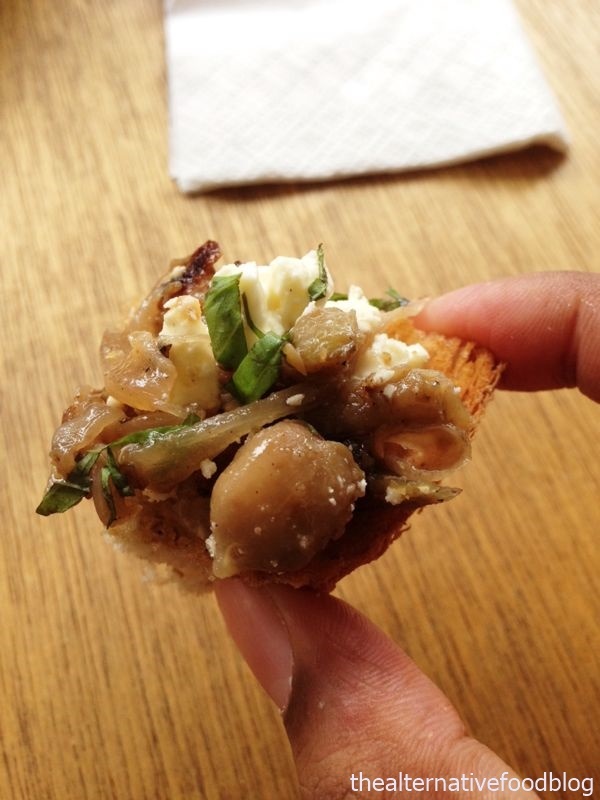 We also tried the Croustini. When I placed my order, I hadn’t even noticed the aubergine on the menu. It was only after we had ordered and were waiting for our meal that Kit reminded me of my absolute detest for mushy aubergine. The colour of the entire dish is of course, not the most pleasant – brown with specks of yellowish cheese and hints of green mint leaves. Kit and I shared this dish too and I think this dish may have changed my perception of aubergine. 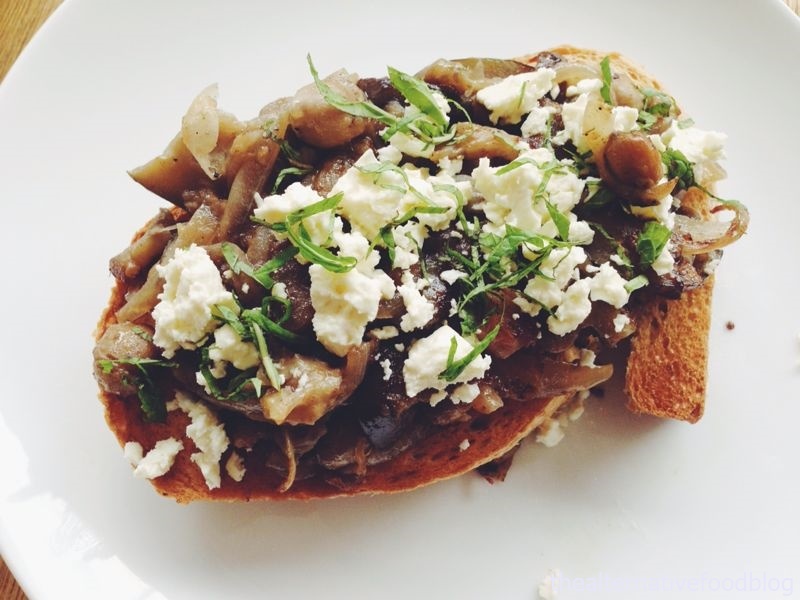 The dish is made up of aubergine cooked with chick peas on sour dough with mint leaves and feta cheese. Individually, a lot of these elements are really sweet because of the addition of caramelised onions however, the feta and mint does wonders and cuts through the sweetness of the dish. It really does add a different dimension to the entire dish – which I loved. Without the mint and the cheese, I’d have felt like the dish lacked a certain something.. but I didn’t have to think about that because we loved it so much, our plates were clean at the end of the meal! 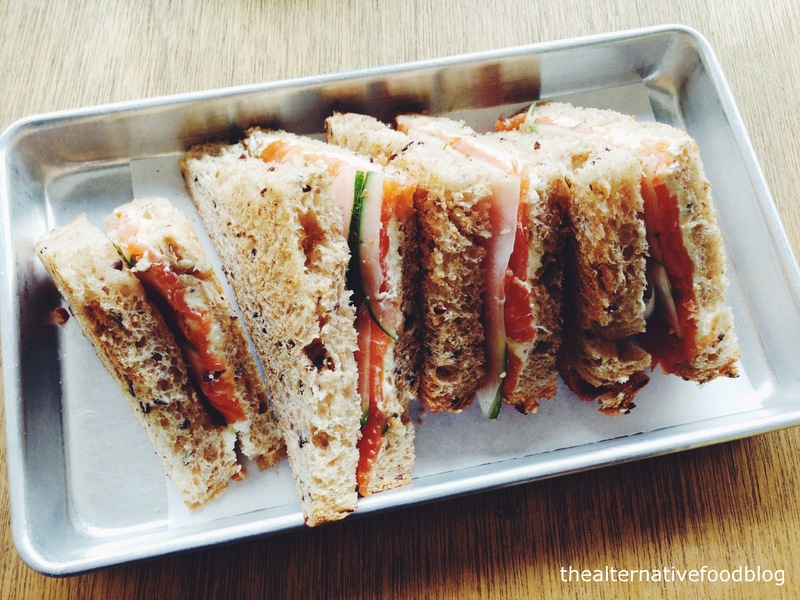 I also tried their Smoked Salmon Sandwich which was just delicious. 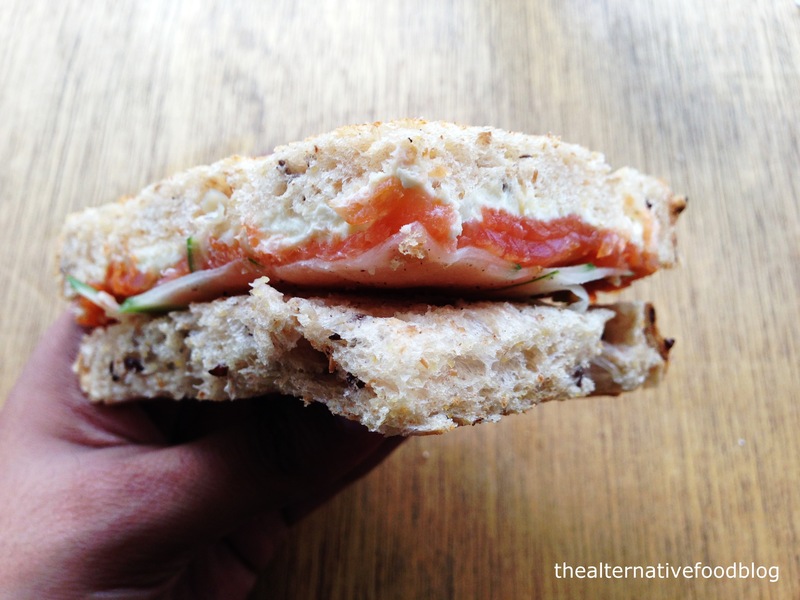 If you’ve read this site long enough, you’ll know that I am fussy about my smoked salmon. I am not, ironically, a fan of the fishy taste that accompanies smoked salmon that isn’t fresh. I was a little worried when ordering this (as I always am) but thankfully, this did not disappoint. If you’re expecting some sort of extremely well-dressed and posed food on a plate, you’ll be sorely disappointed because the food here, we have concluded, is meant to be simple and hearty. There’s very little pretense and ‘fluff’ that’s added to the dish. What you see is what you get, and honestly, what you get is really pretty darn good. The sandwich comes spread with cream cheese and dill which I felt left the dish with a very fresh taste. There are no capers in this dish but to be honest, I didn’t miss it that much and I loved the fact that my bread was toasted and served warm. Ten points from me, for sure. 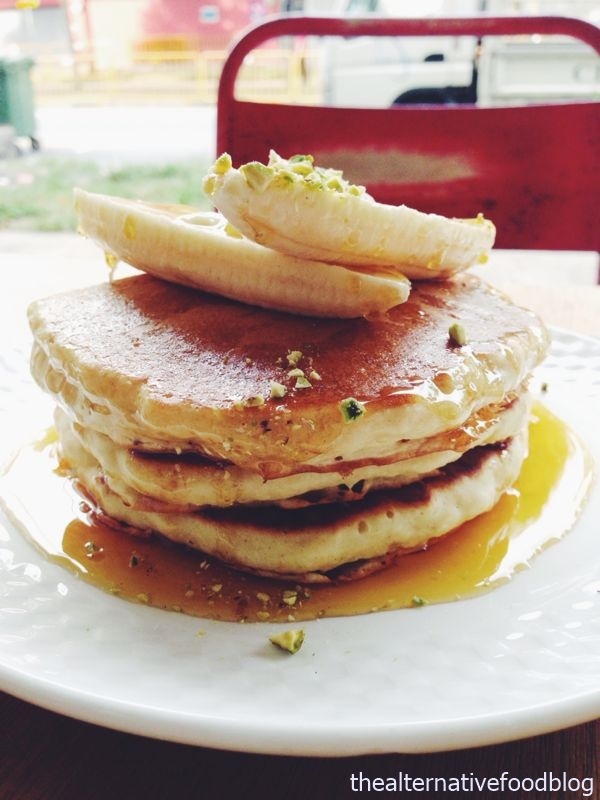 Finally, Kit and I ordered their Pancakes Stack which is three pancakes, ricotta cheese, bananas and crushed pistachios. 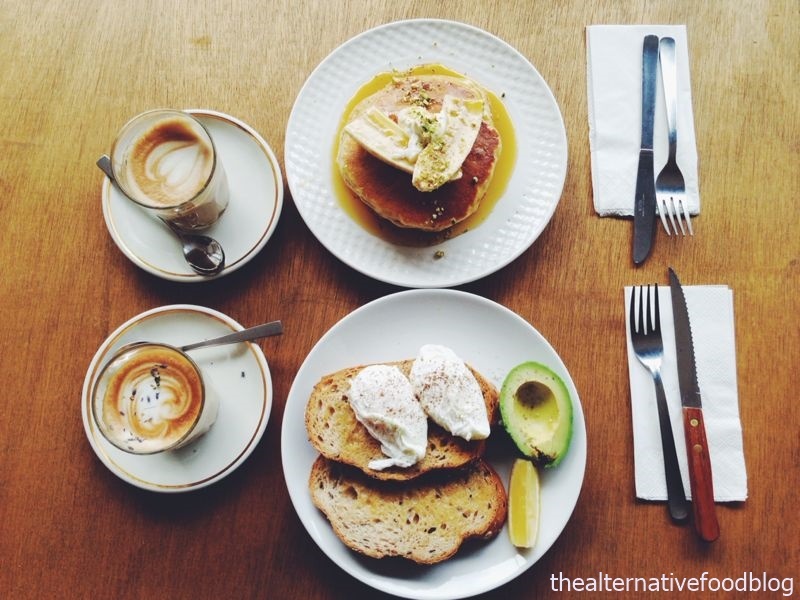 The thing with pancakes is that it boils down to personal preference – some people like it thick and fluffy ala American style, while some people like it the Australian way – thin and crepe-like. The pancakes here are thick and slightly dense and the generous serving of three pancakes were a little too much for Kit and I to stomach. Perhaps we had just come from a run so we were craving more savoury than sweet so we didn’t quite finish this dish though I thought the addition of the ricotta was ingenious and added a really nice sourish element to an otherwise very sweet dish. Between us, we also had a lavender latte and a normal latte. I’d read raving reviews about the lavender latte so I thought I would be adventurous (I am a skim latte girl, 99.9% of the time). 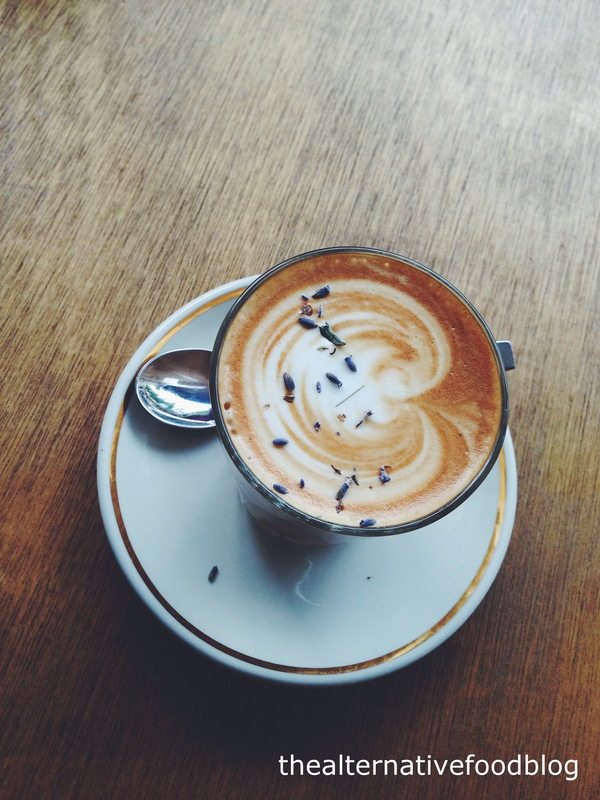 There’s no denying that the taste of lavender is definitely well infused into the latte and it would be a hit with people who love flavoured coffee but I am a coffee purist and flavoured coffee doesn’t quite sit with me. I liked it, but I think next time, I’ll head back for a normal cuppa joe. As for Kit, she was pleased with her soy latte. The coffee was smooth and mild, and the soy milk didn’t curdle. Usually, soy milk curdles when it comes into contact with water or coffee that is too hot and it spoils the coffee experience. 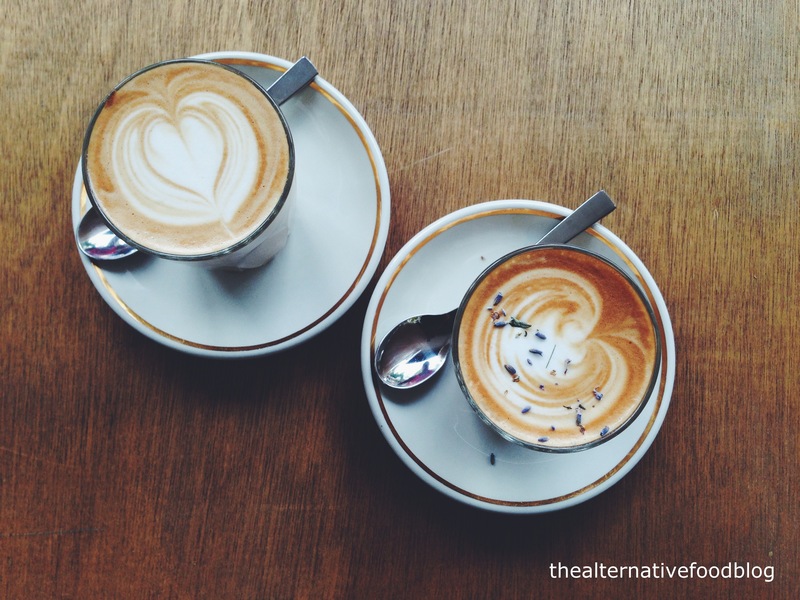 However, the soy latte at The Bravery was prepared properly and the coffee remained milky until the very last drop. I would be lying if I said I haven’t been thinking of their poached eggs since our last visit there. 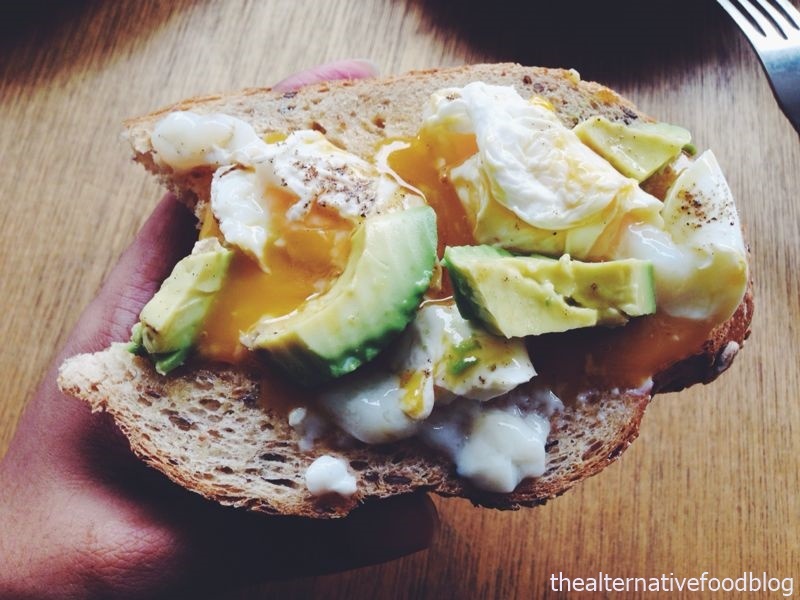 These days, I’m just waiting for the storm at work to pass so that I can find the right time and opportunity to drag someone down to The Bravery with me so that I can sink my teeth into those beautifully poached eggs and creamy avocados. Our Ratings: ♡ ♡ ♡ ♡/ ♡ ♡ ♡ ♡ ♡ (4 out of 5 hearts).